A delegation from the Party Central Committee’s Commission for Popularisation and Education led by the commission’s deputy head Mai Van Ninh paid a visit to Russia from August 20-24. 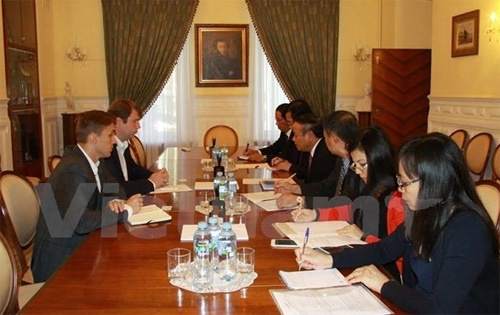 The delegation held a working session with Vice Chairman of the Communist Party of Russia (CPR) Dmitry Novikov in Moscow on August 23, at which the two sides expressed their delight at the growing comprehensive strategic partnership between Vietnam and Russia. They agreed that the recent bilateral relations have yet to be on a par with the two countries’ potential, so it is necessary to take measures to enhance the cooperation between the two parties and States. 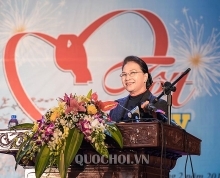 The host was informed about the outcome of the 12th National Congress of the Communist Party of Vietnam as well as the achievements that Vietnamese people have gained throughout 30 years of Doi Moi (reform). Ninh also highlighted difficulties and challenges that Vietnam is currently facing, and the country’s preparation for the 18th International Meeting of Communist and Workers’ Parties to be held in Vietnam next October. The same day, officials of the United Russia party hosted receptions for the Vietnamese delegation. Director of the party’s information and mass media department Pavel Klimovskyi informed the guests about the party’s situation and its preparation for the State Duma’s election on September 18. The Vietnamese party official noted that under the leadership of President Vladimir Putin and the United Russia party, Russia has overcome the economic downturn and record growth. 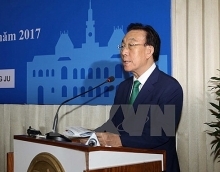 He also asked the Russian Government to create the best possible conditions for Vietnamese expatriates to live and work in Russia. Earlier, the Vietnamese delegation attended a working session with director of the cultural heritage department under the Russian Ministry of Culture Yuri Evtiukhin to share experience in cultural heritage preservation./.